The flagship National Disability Insurance Scheme is on track to cost more than $33 billion by the end of the next decade after executives in charge of the rollout for the first time singled out children with “high-functioning autism, developmental delay and sensory disabilities” as one of the key challenges. 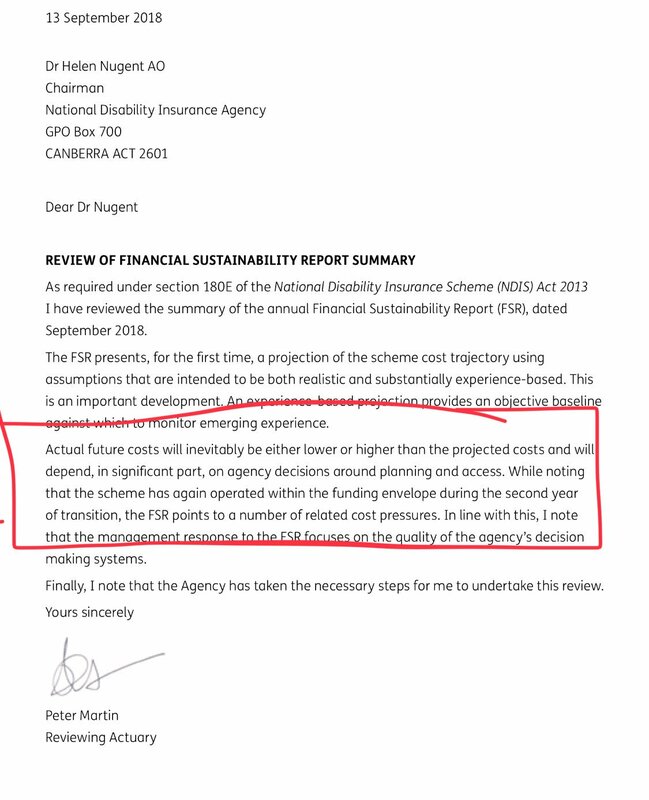 In its five years, the Nat­ional Disability Insurance Agency, which handles the rollout of the scheme, has not gone into detail about specific causes of budget risks, but its 2017-18 annual report confirms there are at least four major factors never modelled by the Productivity Commission. The agency is now predicting total NDIS costs will rise from 0.9 per cent of GDP in 2020 to 1.4 per cent in 2030, hitting an even more expensive peak 15 years earlier than first forecast. In 2014, The Australian first revealed $6.1bn in extra costs as a result of people turning 65 and staying in the NDIS but this was based on immature data projections in 2044. Under a 2011 Council of Australian Governments agreement, the commonwealth funds all costs relating to aged care and this includes older Australians in the scheme, which was not modelled by the Productivity Commission. The scheme has also inherited new cost burdens under poorly drawn bilateral agreements with the states and territories. “This projection is in line with the estimates shown in the 2017 Productivity Commission report in the short to medium term, after allowing for costs not anticipated by the PC such as the introduction of school transport, coverage for children with developmental delay and the current implementation of the National Injury Insurance Scheme,” the annual report says. Of these, fewer end up leaving the NDIS than predicted, even after they have gone through years of early intervention ­support that was designed to temper ongoing reliance on the scheme. The Weekend Australian revealed in May the NDIA was working on a behind-the-scenes plan to reduce the number of children with autism in the scheme, but the agency has never publicly confirmed autistic kids with a low level of disability had been targeted. Last month, Social Services Minister Paul Fletcher and Health Minister Greg Hunt announced a nationally consistent autism diagnosis guideline had been approved. This recommends dis­mant­ling the link between autism “severity levels” and funding that would pave the way for the NDIS to introduce one-on-one functional assessments of each new entrant to determine their eligibility. “A pilot will commence in Oct­ober 2018 to consider the introduction of independent functional assessments to more objectively inform access and ongoing eligibility decisions, particularly for children who have entered the scheme under the early intervention requirement,” the NDIA annual report says. This appears to be a concession that the variability in support levels has been unfair, with higher-needs participants sometimes missing out on basic funding. The NDIA has an operating surplus of more than $950 million booked at the end of June, but this is largely because participants did not spend about $2.9bn of the $7.7bn in committed support and if this catches up, as it should, there may be signs of trouble. “The relatively low levels of utilisation to date has meant the scheme has operated within budget,” the annual report says. Reviewing actuary Peter Martin says whether or not the NDIS comes in on budget or over budget is almost entirely due to the willingness of its managers to enforce rigorous eligibility conditions. “The financial sustainability report presents for the first time a projection of the scheme cost trajectory using assumptions that are intended to be both realistic and substantially experience-based,” he says in a letter to NDIA chair Helen Nugent. The NDIA has added a subtle but significant change of language to a line it has been using in official reports since 2013. While previously it has said the best estimate for full NDIS costs in 2020 remain those of the Productivity Commission, it has modified the wording in the past year. The number of children in the Scheme is higher than expected, particularly for children with high functioning autism, developmental delay and sensory disabilities. The number of participants transitioning out of the Scheme who have entered under the early intervention requirement is lower than expected. And the supporting letter from the external actuary can be downloaded below. The appearance of "autism" in the Australian's headline is unjustified. The NDIS used the term "high functioning autism" showing its especially poor understanding of ASD. It is not clear whether the NDIS actually collects information on whether participants have "high functioning autism". It would be concerning were it collecting this information but not collecting the detail required for a properly documented diagnosis according to the DSM-5.